To multiply two multiple-digit decimal numbers, you first need to know how to multiply two single-digit decimal numbers. This requires the memorization of 100 facts, or 55 facts if you exclude the commutative or “turnaround” facts. These facts are usually represented in a “multiplication table,” also known as a “times table.” Example facts are 2 x 9 = 18, 9 x 7 = 63, and 1 x 6 = 6. A multiplication problem is written with one number on top, called the multiplicand, and one number on the bottom, called the multiplier. The algorithm has two phases: the multiplication phase, where you produce what are called partial products, and the addition phase, where you add the partial products to get the result. In the multiplication phase, the digits of the multiplier are stepped through one at a time, from right to left. Each digit of the multiplicand is then multiplied, in turn, by the current multiplier digit; taken together, these single-digit multiplications form a partial product. The answer to each single-digit multiplication comes from the multiplication table. Some of these answers are double-digit numbers, in which case the least significant digit is recorded and the most significant digit is carried over to be added to the result of the next single-digit multiplication. When the multiplication phase is done, the partial products are added, and the decimal point is placed appropriately. (If there were any minus signs, they would be taken into account at this point as well.) This gives the answer 20.511. 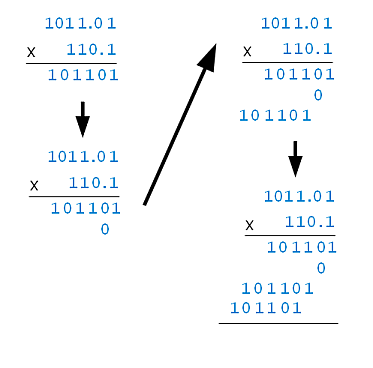 Binary multiplication uses the same algorithm, but uses just three order-independent facts: 0 x 0 = 0, 1 x 0 = 0, and 1 x 1 = 1 (these work the same as in decimal). If you perform the multiplication phase with these facts, you’ll notice two things: there are never any carries, and the partial products will either be zeros or a shifted copy of the multiplicand. Observing this, you’ll realize there’s no need for digit-by-digit multiplication, which means there’s no need to consult a times table — which means there’s no multiplication, period! Instead, you just write down 0 when the current digit of the multiplier is 0, and you write down the multiplicand when the current digit of the multiplier is 1. Each step is the placement of an entire partial product, unlike in decimal, where each step is a single-digit multiplication (and possible addition of a carry). In the addition phase, the partial products are added using binary addition, and then the radix point is placed appropriately. This gives the answer 1001001.001. You can check the answer by converting the operands to decimal, doing decimal multiplication, and then converting the decimal answer to binary. 1011.01 = 11.25, and 110.1 = 6.5. Their product is 73.125, which is 1001001.001, the answer we got using binary multiplication. You can also check the answer using my binary calculator. 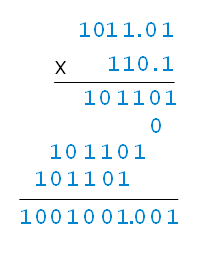 Computers don’t multiply in exactly this way, but they do exploit the simplified view of binary multiplication that I’ve described. Would you mind if I include this post in the Math and Multimedia Carnival #21, being hosted on my site, Math Concepts Explained at http://sk19math.blogspot.com. This is a great introduction to and demonstration of working with binary arithmetic! Sure, go ahead. I’m glad you found it useful. At the addition stage what happens when you add 1+1+1+1 for example? OK so .1 in binary is .5 in decimal, .01 is .25 and .001 is .125. Where do I learn how to display 3.87 and 5.3 in binary? Thank you. I’m assuming you want the method that converts by hand. Separate the integer and fractional parts and convert them separately. For the integer part, use “repeated division by 2”; for the fractional part, use “repeated multiplication by 2” (search the Web for the details). The answer for the integer part is the remainders reversed: 1110. Thank you for your swift response! I had assumed operations in binary would be easy – and they are until one hits division. I can’t even handle 5/3. Thanks again. Just add the number of places in both factors (the multiplier and multiplicand). what are the four categories of binary multiplication? Please give me more context — what are you looking for? i m solving past papers of digital system design of our university,question mention as Q#3:a)how binary multiplication can be done? b)what are the four categories of binary multiplication?. i solve part (a) but cannot solve part(b). I still don’t understand “categories” in the context of your course. Sorry. Hi Rick thanks for the assistance in converting fractional decimals to binary but what do I do when the fractionals just keep repeating as I multiply by 2? Is there a way to tidy it up? You must have intended your comment for a different article (http://www.exploringbinary.com/base-conversion-in-php-using-bcmath/ ?). In any case, if it keeps repeating, just note that in the answer. For example, 0.1 decimal becomes 0.00011 binary. Rick my question is in relation to your above explanation about converting fractionals to binary. I was wondering, instead of constantly multiplying by 2 like in the example, if it could be safely rounded. It was more to do with other examples where the bits are more variable in their sequence but it was ongoing. If it could be rounded like you suggest in your response then that is perfect. I am new to computer arithmetic so sorry if it seemed silly to ask. I don’t understand your question. 0.00011 is the exact mathematical answer. In a computer, it would be rounded, depending on the format. For single-precision IEEE, it would be rounded to 24 significant bits: 0.000110011001100110011001101. You still need some algorithm to generate all those bits in the first place, so in that sense the “constantly multiplying by 2“ is necessary. If we perform binary multiplication for two numbers, and we will get some result. For some result, at adding place if we get four 1’s, then should we take two carry bits to add for another number? For decimal, the analog would be if a column added up to 100 or more. (Not that you would ever have a multiplication in practice with that many partial products.) Let’s say the column sum is 215. You would write down a ‘5’ and carry the ’21’ to the next column. In binary you follow the same procedure. (This “composite carry” happens much more readily though — with as little as three partial products.) 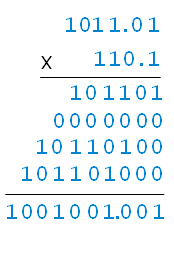 If your column adds to binary 101, for example, you write down ‘1’ and carry the ’10’. This probably gets too confusing in binary, so it may be easier instead to do a series of additions, in pairs. I’ve problem in this binary operation. provide me complete step by step solution with addition & carry generated during binary addition of this sum…..
Tell me more about what you did so I can see where you went wrong. (10111)2 * (1110)2 convert binary to hex decimal equivalent. Rick Regan sir, can you please tel me the procedure. Let’s say they needed to multiply 12×34. Each row is obtained by doubling the previous row. All these operations were very easy and natural for them, because they used an additive number system. So to double a number, one could simply double each symbol in the representation of a number (and collect them when needed into symbols of greater value, like with Roman numerals). To add them, they simply gathered all the symbols. Because that’s what multiplication really is, at the deepest level: a *change of units*. A property of a number is that it just takes the unit, whatever it is, and repeats it that particular number of times. So the number 34, when applied to the “old unit” (1), repeats it 34 times to get 34 (itself). But when applied to another unit (12 in this case), it repeats *that* unit instead 34 times, to get 34×12=408. The Egyptian algorithm simply breaks up this multiplication into several easier steps (doubling is easier than the full-blown multiplication) by expressing one of the numbers in binary, and then scaling *that* by the new unit. How does it relate to binary multiplication? Well, just represent all those doubled numbers from the other column in binary, and you will see that they are the same bit pattern, just being shifted by one bit to the left each row. So adding the rows which match the bits set in the multiplier 34 (or the powers of 2 it is made of), you add up only the selected shifted rows of the same number (the multiplicand, or the new unit). Please explain to me how the binary point of the fractions is determined. I understand the process, but idk how you determined where to place the binary point. Thank you. Just like in decimal multiplication, just add the number of places in the multiplicand and multiplier. In the example, the multiplicand has two places, and the multiplier has one, so the answer has three. Rick I have a doubt about the partial product’s part . Can u please briefly explain it? Thank You!